This is a wonderful spread--I wish I could see your sketchbook in person! 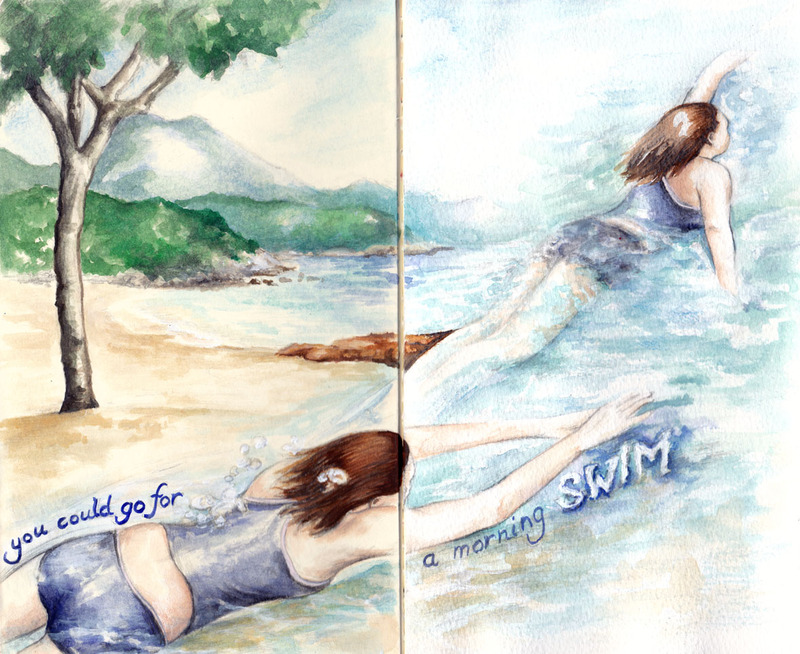 Oooooh I love the spread of the page, and the way you drew the water! Really nice background too, and nice folds of the swim suit and the strands of hair =) great work! You can almost feel the water on your skin! I love what you've done so far..I wonder what comes next? This is very different from your usual work - I like it especially the obviously submerged parts of the bodies; beautifully done. WOW! I love this! The composition is fabulous and I love the colors! I love this spread...it has such a calm and refreshing feel...mmmmm. Fantastic composition and effect. Love it! I just adore your sketchbook project, with the ongoing "story" going from spread to spread. Lovely compositions, nice texting, great subjects. This is just fantastic! I will bee looking forward to pages to come! Wow, what amazing work. I love it. This is such a creative series! Love where your imagination is taking you.